The Luminox Original Navy Seal Watch has been developed to provide reliable service under the most extreme conditions. Using the unique Luminox Light Technology, these watches have cutting edge luminescence which is Always Visible. In fact, rather than using luminescent paint which has to be recharged and loses visibility over time, they use tiny gas light tubes that are always on. They do not need to be recharged, nor do you need to push a button to activate illumination like required by some battery operated watches. Made with durable materials and to exacting standards, I was excited to complete my own take of the Luminox 3000 review. Luminox watches use a proprietary illumination that includes hand applied gas tubes on the hands, face and bezel if necessary. This technology and time consuming application method creates a watch face that is always readable. The light bars are always lit, making the watch visible in the darkest situations, 24 hours a day for more than 25 years. The original watch in this series, the 3001 maintains its repitation of quality and durability. Constructed of a stainless steel case painted black with a polyurethane band with an adjustable buckle closure, this watch is also water resistant to a depth of 200 meters. 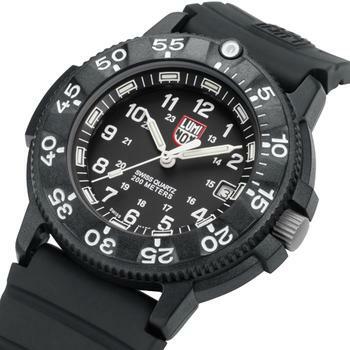 It has a polyurethane black bezel that is unidirectional and also has the Luminox accents to ease in use. The precision Swiss movement keeps accurate time and is protected by a scratch resistant saffire crystal with an anti-reflective coating. 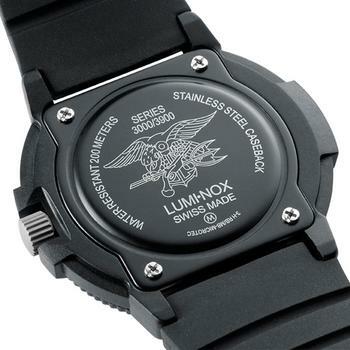 This variation of the original Navy SEAL watch features all black features with Luminox accents for visibility and stealth. The BO features a black rubber case and bezel for improved shock resistance and noise reduction. This makes this watch a favorite of many covert units and law enforcement, not just the Navy SEALs. 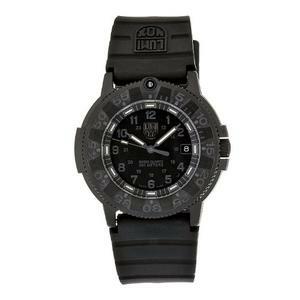 The 3003 version of the Luminox Navy SEAL watch is similar to the model 3001 with some exceptions. This watch has a blue watch face with polyurethane case, bezel and band. The face is marked for both standard time and military time, making conversion simple. The luminescence is bright, making the watch visible at all times and making it easily readable. 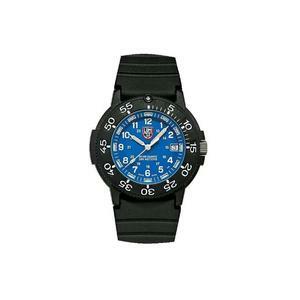 When considering a Luminox Navy SEAl watch, you should be sure to completely research your purchase. Some things that may weigh on your decision are the construction of the bezel, the Navy SEAL propeganda that is included, the extra brightness of the luminescence, and the polyurethane strap. The bezel, while durable, can wear smooth over time because it is constructed of polyurethane. The watch was designed for Navy SEALS and is packed with information promoting the SEALs. I don’t find this particularly offensive, but some may. Especially when the purchaser is a member of another service or law enforcement, who have adopted the watch as standard equipment. 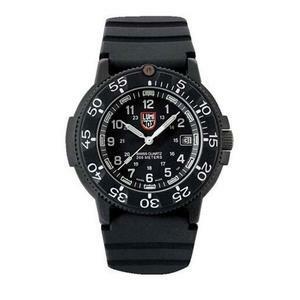 Luminox became famous by being Always Visible, which may be an issue on stealth operations. The bright light bars are highly visible and may require being covered. The Polyurethane band is functional and quiet, but you may want to invest in a more durable band if you are tough on your watch. 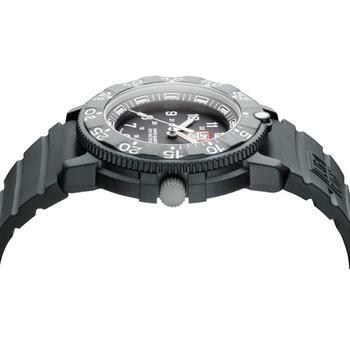 As seen from the eyes of a tough watch afficionado, I have to say the Luminox 3000 series offer a great overall package. In the end, it is about personal flair and preference, a question which you have to answer yourself. If you are a Luminox fan, be sure to check out the other popular series, namely the 3050 Colormark and 3180 Steelmark Colormark collections.